There’s a reason why Madison was ranked one of the Top Ten Happiest Cities in the World by National Geographic: an amazing experience always awaits! Our vibrant city, situated between two sparkling lakes, is home to environmentally friendly facilities, award-winning amenities and a college-town culture beyond compare. Our hotel mix includes full-service, four-star hotels, urban convention and boutique hotels, more modest accommodations, plus unique and classic B&Bs. Many of our accommodation partners offer meeting space—ranging from elegant ballrooms to unique venues for breakout meetings and more. 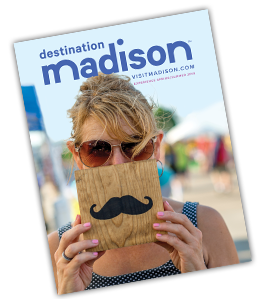 100% of respondents said Madison met or exceeded expectations as an event destination. 77% responded that attendee excitement about the destination was an important part of their selection. 77% of planners rated us as good or excellent in service areas including responsiveness.